Our 440gsm banner is suitable for both Indoor and outdoor use. 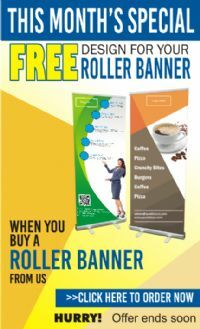 This quality banner is normally best for short term use such as parties, charity events etc and promotions pre-opening advertisement, offer updates etc. The material of the banner is Fire retardant to suit interior applications. Smooth surface allows high quality printing on it. The 550gsm High quality coated PVC banner comes with an attractive matt finish. It is Suitable for medium to heavyweight banner applications and is the best option for long term use. The banner is resistant to cracking at low temperature and has greater tear resistance in adverse weather conditions, which makes it perfect for long term outdoor use. The high quality coating provides a Smooth printing surface which gives superior quality printing results for a longer time. Both materials are printed digitally on wide format printers using high quality and outdoor inks. 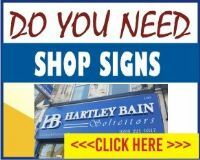 Please note that a banner is a form of a temporary sign which means it could be damaged or may experience fitting problems in extreme weather such as during winds exceeding 30mph. If this occurs, we hold no responsibility for the product. Do you want our designers to create artwork for your Banner? Turnaround times: 2-3 Working days.